On June 16-18, ECC Sokolniki will host VAPEXPO Moscow 2017 – a legendary global vape exhibition of electronic vaping devices. VAPEXPO Moscow 2017 is a global event in the world of Russian vaping, as it brings the national vape market to international arena. Exhibition guests get acquainted with global brands and become familiar with the vape culture of foreign countries. 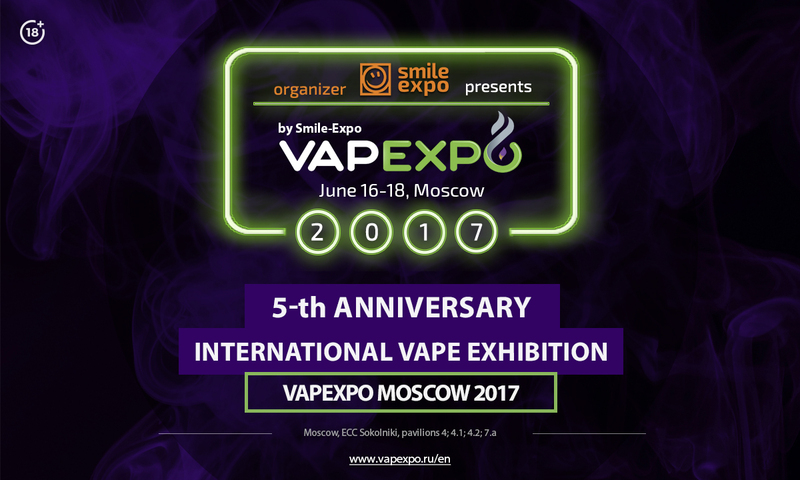 Besides that, June VAPEXPO Moscow is an anniversary exhibition – the fifth one – and will last for three days instead of the usual two! 2016 – 250 exhibitors, 8500 sq.m, 10 000 attendees. These numbers will increase in June. A bigger exhibition area will result in a larger number of exhibitors, primarily foreign ones, for whom the Russian vape market is strategically important. build partnership contacts in the informal environment thanks to the business cocktail party – after the official part of Vape Volution. Conference will take place in the separate pavilion №7.а of ECC Sokolniki, which will allow listeners to concentrate and take in as much useful information as possible. Anniversary VAPEXPO Moscow will feature a global cloud chasing tournament – World Series of Vaping, which was held in Miami in October of 2016. The winner will be awarded the title of the world’s best cloud chaser and an impressive cash prize. Vape Tricks Battle – a trick contest for those who can restrain vapor. The Massive Cloud Making – a traditional general vapor cloud, which will cover the whole city! There are so many prizes at each VAPEXPO Moscow that organizers came up with a separate name for this phenomenon – Vape Shara! Huge numbers of unbelievably cool giveaways will be constantly handed out from the stage. And of course prizes for participation in the contests! Vape Awards 2017 – ceremony of awarding the best industry representatives. A grandiose party with the upper crust of vape community will soon become a people’s award, as winners are chosen by guests of the event. A new activity – Vape Verdict – was prepared for the anniversary VAPEXPO Moscow event! For the first time ever, bloggers of the top-class community Vape Alliance will give a verdict on the product and manufacturer will have a chance to explain its conception. Venue: Moscow, ECC Sokolniki, pavilions 4; 4.1; 4.2; 7.а.